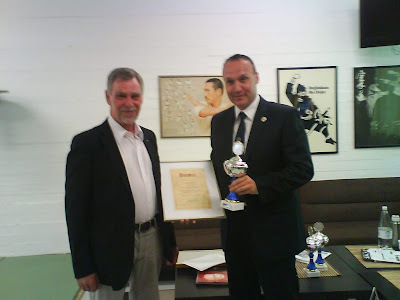 On Saturday 6 of June 2009 in capital of Finland, did oldest Martial Art Magazine: BUDOKA give diploma and trophy for ITF Finland President, Mr. Jean Feller, 5th dan. First time ever, this honour did come ITF Taekwon-doist. This trophy has been given since 1987 in Finland. 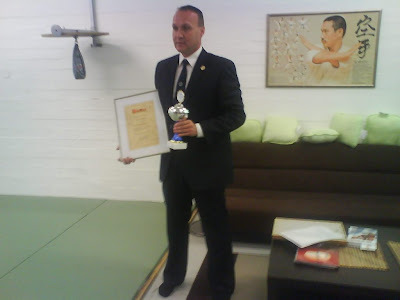 This annual "FIGHTER"- diploma and trophy will only given person who has literally sacrifice their lives for development own Martial Art in Finland and has always respect all tenets of own art. This honor was given by Mr. Peter Schild, who is Head Editor of Budoka Magazine.